There are a lot of reason why blogging is important to SEO results. It might seem like blogging is a waste of time for your business and it’s website, but there are a lot of benefits to regularly blogging for your business and company. 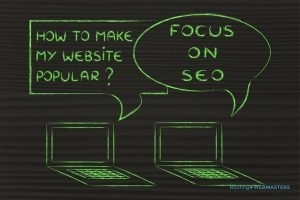 There are a couple of reasons why blogging is important to SEO. How often do you update your website with new content? Probably not that often. With blogging, you are creating new content for your website. When you create content that answers a question or provides useful information to your readers, people will begin to see you as an expert in your industry and in turn establishing more business. Blogging about topics that are current or are asked frequently can actually produce a lot of attention. If someone searches “How to maintain gutters” and you have a blog post dedicated to gutter maintenance, you are gaining an audience and generating more leads and traffic to your website. Because you are producing content that uses SEO keywords and topics that are searched frequently, you are able to improve your SEO ranking. This can also help when you want to have a lead over your competition. Blogging is important for so many reasons and if you would like more SEO services that can really benefit your roofing company, give us a call at (800) 353-5758 today. We are ready to help you gain more leads and a wider audience.